Tianjin is a coastal city by the Bohai Sea. Tianjin Home Port is one of the biggest port in China. It is the maritime gateway of Beijing. The page will focus on How to Travel from Beijing to Tianjin. Click here to view how to travel from Beijing to Tianjin Port. 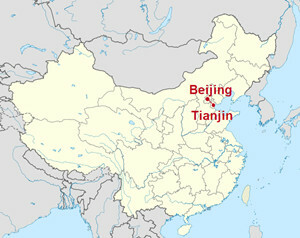 Click here to view how to travel from Tianjin Port to Beijing. The high-speed trains travelling direct from Beijng South Railway Station to Tianjin Railway Station is very popular. It takes only 33min on the way. The trains depart about 10 min. These train numbers start with an “C”. There are also high-speed trains travelling from Beijing South Railway Station to Tianjin South Railway Station with the train numbers starting with an “G”. There are also high-speed trains travelling from Beijing South Railway Station to Tianjin South Railway Station with the train numbers starting with an “D” . There are other trains travelling from Beijing to Tianjin, which takes about 1h20min-2h. Ticket prices range from 19.5CNY. Beijing South Railway Station is in the south of Beijing, Fengtai District. Take Subway Line 4 and get off at Beijing South Railway Station. Beijing Railway Station is in the 2rd ring of Beijing downtown, not very far from the center of the town. Take Subway Line 2 and get off at Beijing Railway Station. Take Subway Line 9 and get off at Beijing West Railway Station. Take Subway Line 1 and get off at Military Museum, then take No.21,99,320 Bus to Beijing West Railway Station. Tianjin Railway Station is in the downtown of the city. Passengers may take Subway Line 2,3,9 to other places in Tianjin. Ticket prices range from CNY 2. Tianjin South Railway Station is in the south of Tianjin downtown. You can take No.707,718 Bus to other places in Tianjin. We ChinaTour.Net offer a car rental service. Click here to rent a car. After visiting Tianjin, if you want to go to other places in China, click here to book a flight ticket or a train ticket.